Sunday Quote!- Genesis as Sui Generis (Its Own Genre)? | J.W. Wartick -"Always Have a Reason"
Sunday Quote!- Genesis as Sui Generis (Its Own Genre)? Genesis as Sui Generis (Its Own Genre)? Thus, he asserted, we cannot see these early chapters of Genesis as standing apart or unique as a completely separate genre. To do so would be to make it unintelligible. It seems to me that this is on-point. We shouldn’t just throw up our hands and separate Genesis from the rest of the Bible as its own genre, distinct from any other human writing. God would not have communicated in a way that we cannot understand. What do you think? Is Genesis 1-11 completely unique? Should we give up on trying to discern its genre, or is it clearly discernible? 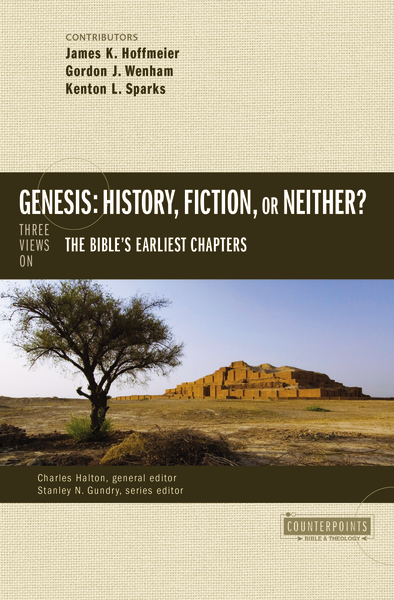 Kenton Sparks, “Response to Gordon J. Wenham” in Genesis: History, Fiction, or Neither? Charles Halton and Stanley Gundry, eds. (Grand Rapids, MI: Zondervan, 2015). « “Debating Darwin’s Doubt” – A Response to the Doubters? I think we should give up on trying to obscure what God has made clear: Genesis is history. “Let there be light!” So there was light./ evening, morning the (first, 2nd etc) day/ the Sabbath “made for man” in clear conection with this first week (Mark 2:27, Ex. 20:8-11)… All this makes any supposedly “non-cognitive” approach to the first chapters of the Bible an artificial and inconsistent issue (a kind of “red herring”). This “method” reminds me that “such fine way of rejecting” God’s Word that Jesus mentions in Mark 7:9. That’s my view. God bless. we cannot see these early chapters of Genesis as standing apart or unique as a completely separate genre. To do so would be to make it unintelligible. No, it returns it to being the myth it always was. If that’s unintelligible for some, then it’s because they aren’t sure how to read a myth and gain the insights it offers into what it means to be human. What’s unintelligible is to take this myth or any other and argue that some later event explains its ‘real’ meaning. So are you disputing the notion that “myth” is itself a genre/categorization? So your comment was a bit of a non sequitur, it seems. This quote was about saying Genesis is it’s own genre–absolutely unique. But your comment suggests you read it as saying it can’t be myth, apparently your favored genre to call it. Indeed you chastised me for not allowing that as a genre. That’s not what I’m doing. I’m saying it is not its own genre. Thanks for offering your thoughts on it as myth though. I don;t see how it’s a non sequitur. I think we can see these early chapters of Genesis as standing apart (from the rest of Genesis and the rest of the bible) as a completely separate genre (without adding anything more to it.) And that genre is ‘Myth’.. not theology. B) as a way to avoid criticism of its factually incorrect claims if held to be literal, historical, and actual. Christian assume that only the Christian interpretation of Genesis (i.e. the correct interpretation) gives (the correct) meaning to Genesis and therefore justifies Jesus’ sacrifice… atonement for Adam’s original sin on behalf of all mankind who (supposedly) descended from an historical Adam and inherited his original sin. ‘B’ is the usual selection, which is why the claim that it is “unintelligible” without this Christian (theological) interpretation of Jesus’ sacrifice is so often made. I disagree. I think it IS intelligible and quite complete without ANY Christian baggage and stands on its own merit (which may explain why it was around for thousands of years before Jesus showed up and died to ‘explain’ its meaning). I don;t see my criticism as a non sequitur but aimed squarely at the theists presented. I’m positive you’re misreading the quote, though that could just be because you’re lacking the context. The quote is speaking specifically of those who argue that it is its own genre; not a genre distinct from the rest of Genesis, but rather its own, as in a completely unique genre that is sui generis–it is utterly distinct from any other genre, including myth. THIS is what the quote is denying and arguing against. So unless you’re trying to maintain that the beginning of Genesis is a completely unique genre that doesn’t fit into any other genre ever (including myth), your comments are off base. One of the difficulties of presenting the “Sunday Quotes” is to try to give enough explanation or context for readers to get what is going on. For a bit more context, you can see that the quote I provided is arguing that there must be some kind of conformity with existing varieties of discourse, lest we be unable to understand it. Thus, myth is one of the modes of discourse we have, so conformity with that means that it can be understood. Sparks also goes on to say that “Gen 1-11 must be similar to and participate within the generic [genre] conventions of the ancient world…” (farther down 102). What role does Sparks (and do you) assume the Holy Spirit plays in understanding Scripture? Is it possible that God might have communicated in a way that requires the Holy Spirit to properly understand? This might indeed make it unintelligible, but only to the natural mind. I think there are interesting arguments to be made about Genesis 1 in this regards, although perhaps not the rest of Genesis 1-11. This is an interesting question and I am pretty sure I can’t speak for Sparks at all because I’m almost positive that I have not read anything else by him. So as far as I’m concerned I think the Holy Spirit does play a significant role in rightly understanding Scripture, though I’m very hesitant to reduce it to saying that it is unintelligible for those not guided by the spirit. I mean, if that were the case, we’d have to say that a narrative like Jesus’ death and resurrection is unintelligible. Not understood? Thought to be foolishness? Yes, we have that demonstrated even in the comments here. But unintelligible? I don’t believe so. Consider a thought experiment. Suppose you had a narrative of two sisters, and were wondering whether it was a figurative account meant to picture moral behavior, or a real account of two people. Suppose that in one case it is preceded by “Thus saith the Lord, revealed to His servant the prophet –“, while in another case it is preceded by “My eyewitness account of two women’s history, supported by interviews with others who also knew them –“. And suppose that the nature of the narrative itself was such that it could fit either a figurative or literal genre, and either way the account is considered inspired. Would the difference in origin (supernatural revelation versus personal observation) have any bearing on its interpretation? On its genre? Going back to your original question, this raises a slightly different version of the question I originally asked: Is there a spiritual component to establishing genres, or is it strictly a secular activity? Well I don’t really buy into there being any strict secular/religious divide. I’ve written before about how I mostly think it is hogwash, so I would say the question you ask at the end is largely a false dichotomy. There just is no “strictly secular activity” out there. Origin certainly would make a difference in interpretation, but again there just is no strict secular/religious divide, so someone who is “secular” is going to approach it with different expectations, but their expectations will not be devoid of religious expectations either. There are several senses in which any sort of secular/religious divide does not exist. Can you point me to the post(s) you are referring to? I thought it was clear from the context that by “secular” I meant not explicitly taking into account Biblical spiritual principles and concepts when determining the genre of a text. Of course, that in itself reflects a religious perspective, so perhaps using the term “secular” was wrong. An atheist might study the text to determine the author’s belief and what he was trying to express, without actually believing in the spiritual principles being put forth by the author. But the atheist is still exercising a religious perspective. Is that what you meant, or some other sense? I don’t want to get lost in semantics, so let me simplify the question: To what extent should spiritual aspects of the text’s formation be used to determine its genre? Interesting reference, and it kinda illustrates the question I was asking. According to the review, the book describes how each section of Genesis is the account written by an eye witness of the events of that section. Including the first section, which would have been written by the Creator Himself. Even if one accepts the overall argument and concludes that the sections are literal narrative because of that, how do you apply that to the first chapter? Are we to assume that spiritual communication by God (ie, direct revelation) always results in exactly the same sort of text as human-sourced narrative? Is the rest of Scripture consistent with that thought? I think that I might be misunderstanding you, but if I’m not I think that you’re not catching the quote’s meaning. Here’s what I’m reading: it looks like you’re saying that Genesis 1(-11ish?) might be a different genre than the rest of the book, and that seems to go against the thesis proposed here. But that’s not what this quote is suggesting, nor is my analysis. What is being disputed, rather, is that Genesis 1-11 is a completely unique genre. That is, it is not being argued that Genesis 1-11 can’t be a different genre (different genres can obviously exist in the same book–see the Gospels with Parables, narratives, and the like); it is being argued that Genesis 1-11 is not a totally unique genre that exists nowhere else in any human discourse anywhere. It isn’t a genre that we might call gejeruoar, because we wouldn’t be able to make sense of gejeruoar, as it is not a genre that we have any experience of elsewhere; nor could we detect that it is gejeruoar, because we have no other examples to compare it to. That is what the author of this quote was arguing; and I agree. Sorry, I’ve mixed several different sub topics in my replies. Maybe this will be more to the point. Regarding the quote, I agree that it does “conform to a significant degree with existing modes and patterns of discourse” and thus, one can be guided by other similar texts. However, I think it is also unique in some significant ways, so one must take into account its unique attributes to properly understand it. That does not make it completely unintelligible. One way that the text is significantly different is the uniqueness we attribute to it among all other human writings. We consider it a special instance of inspired text because of the spiritual aspects of its origins (among other things). For example, Genesis 1-11 may be considered an instance of the genre Genre-A. In that case, we may recognize that all such texts include spiritual elements (per your assertion), but also recognize that we consider the spiritual aspects of Biblical text to be fundamentally different because of (and leading to) its inspired nature. Thus, I would say that it conforms to a significant degree with other Genre-A writings, but is unique because of its inspired nature. In fact, it may be unique in ways that must be taken into account in many or most applications of its genre to extract meaning. Does that mean that “inspired Genre-A” is now a unique genre? I don’t really know. Any given text is completely unique in that it is different from other texts, so you may have something here. I’m not sure that it undercuts the previous discussion, but perhaps adds to it and expands upon it. I think that maintaining that a text is “Genre-A” while also having its own unique elements makes good sense because of the first sentence I wrote: any text is utterly unique unless it is quoting others. So I may read a fantasy novel, but that doesn’t mean that even though it is genre-fantasy it isn’t a unique instance of genre-fantasy. Is this kind of what you’re getting at? To a large extent, yes. Genre categorization is helpful in analyzing text, but IMHO can be misused when that categorization is then used to override characteristics of the text itself. If you read a novel broadly categorized as fantasy, that had some significant hard science plot elements, it would be ridiculous to assert that the science could not be valid because the definition of fantasy precluded hard science elements (using made-up definitions). That would be placing academic categorization of genre as more significant than the text itself. So with regard to the quote, if our ultimate goal is to “understand” the text, then the genre is useful, but not the only thing to be considered. Whether other aspects make the text a unique example of a known genre, or a unique genre similar to others previously known, may come down to a matter of semantics. In this case, I was trying to point out that there are unique spiritual aspects that are significant in Genesis 1-11. They might cause us to treat that text differently than other historical narratives, even though we might otherwise classify it as such. Does that mean it is a unique genre? Again, I don’t really know.